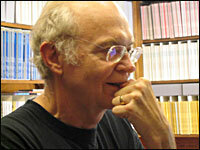 Donald Knuth owns multiple copies of his books translated into numerous languages. The ideas inside transcend language, offering lessons on the essential grammar for constructing fast, elegant programs. Donald is legendary in the computer science world for writing a series of must-have reference books called The Art of Computer Programming. Part cookbook, part textbook, part encyclopedia, these books are also considered by many to be technical and personal works of art.